The first job any gardener has this time of year is that all-important spring cleanup that starts with raking out any leftover leaves, debris, and the remains of last year’s annuals. Using the right rake for the job is half the battle. A leaf rake is what most people picture when they think of a rake – this is the wide rake, usually with metal tines, that’s great for collecting large volumes of leaves. 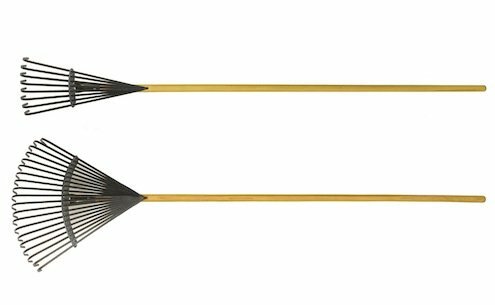 Metal leaf rakes can be tough on plants, though, so if you’re raking out a flower bed you may want to use a leaf rake with bamboo tines instead. A shrub rake looks a lot like a leaf rake, but it’s much narrower. You’ll need one to get into those tight spots like the base of a hedge, around a fence, or in between bushes. A bow rake has short metal tines and a flat edge, and it’s great for loosening soil for planting or for leveling out gravel or mulch. Once your garden is all raked out and cleaned up, you can start thinking about planting season!